As you drive from Jerusalem down to the Dead Sea you pass close by Wadi Qelt at various points. 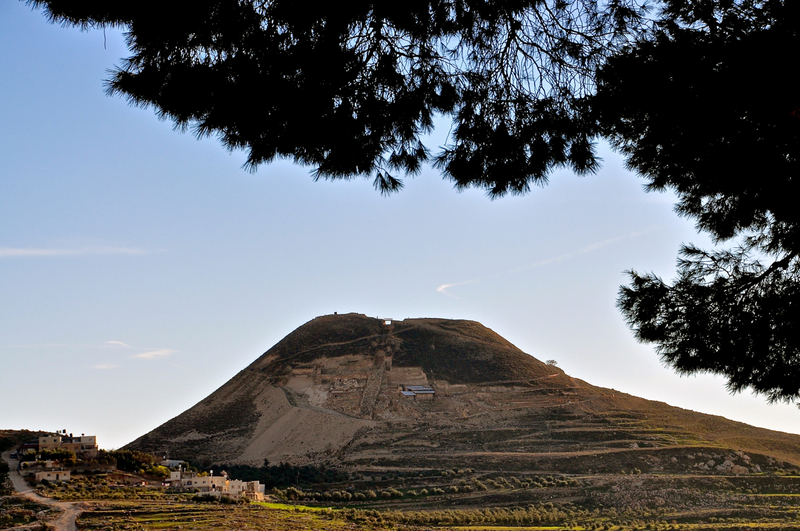 To access it you can go to the nature reserve below Anatot, St. George Monastery or Herod’s Third Palace at Jericho. The palace was built on both sides of Wadi Qelt which during the winter rains flooded and made the palace appear to be floating on the water. Although Jericho is in AREA A, under the control of the Palestinian Authority and out-of-bounds to most Israelis by Israeli law as a tour guide licensed by Israel’s Ministry of Tourism I am authorized to guide there. 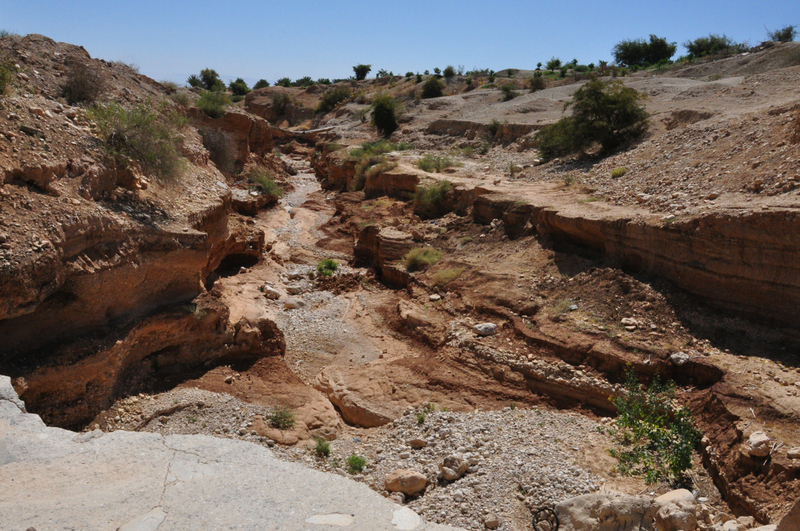 This photo was taken of Wadi Qelt from near the archaeological remains of the palace, looking east as it flows to the Dead Sea. The technical details, shot with a Nikon DSLR camera, ISO 1000, 18mm, F13 at 1/1250 sec. Aside: I’ve also just published my latest blog post on Times of Israel. Check it out at http://blogs.timesofisrael.com/visit-palestine-with-a-guide/ and please share with your friends. This entry was posted in Desert, Nature, Photography and tagged Herod, Herod palace, Jericho, landscape photography, palace, Wadi Qelt on October 7, 2014 by Shmuel Browns. I guided a group today on my Herod the Great Tour visiting Herodium and then the monumental Herod exhibit at the Israel museum. 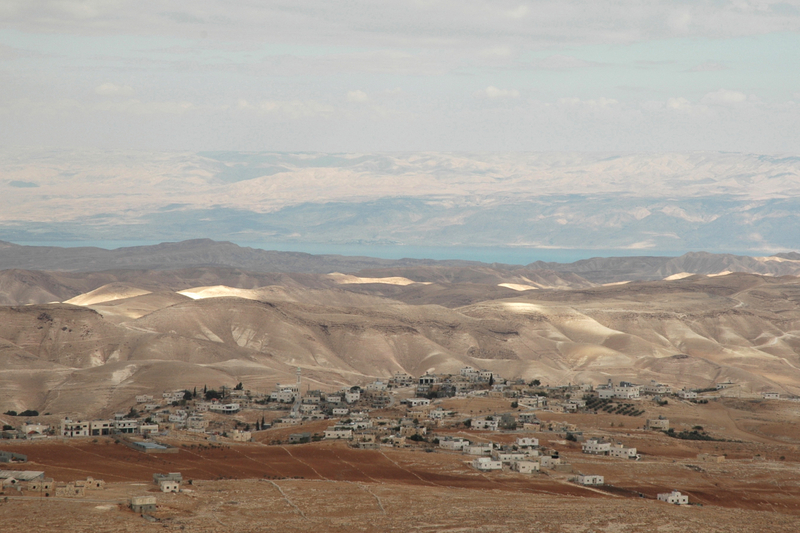 This photo is one I took from the top of the man-made mountain at Herodium looking east towards Jordan. It’s quite amazing that on a clear day you can see as far as the Dead Sea and the mountains of Moab. The technical details – the photo was taken with a Nikon DSLR camera on November 2 (ISO 200, 70mm, F10 at 1/400 sec). This entry was posted in Nature, Photography and tagged Dead Sea, Herod, Herodium, Moab, Netzer on May 19, 2013 by Shmuel Browns. The New York Times article reporting on the Herod exhibit at the Israel Museum concludes with my comments. Shmuel Browns, a tour guide and expert on Herodium who helped Netzer excavate the site as a volunteer, said he was awed by the meticulous reconstruction, particularly of a large basin adorned with several heads that was found in pieces in two disparate places at the site, now an Israeli national park. “They’ve built things from what was found that you could never imagine from what you saw at the site,” Mr. Browns said. “The message is very, very strong about who Herod is and what he did. He wasn’t intimidated by topography, he wasn’t intimidated by material, he wasn’t intimidated by lack of water. 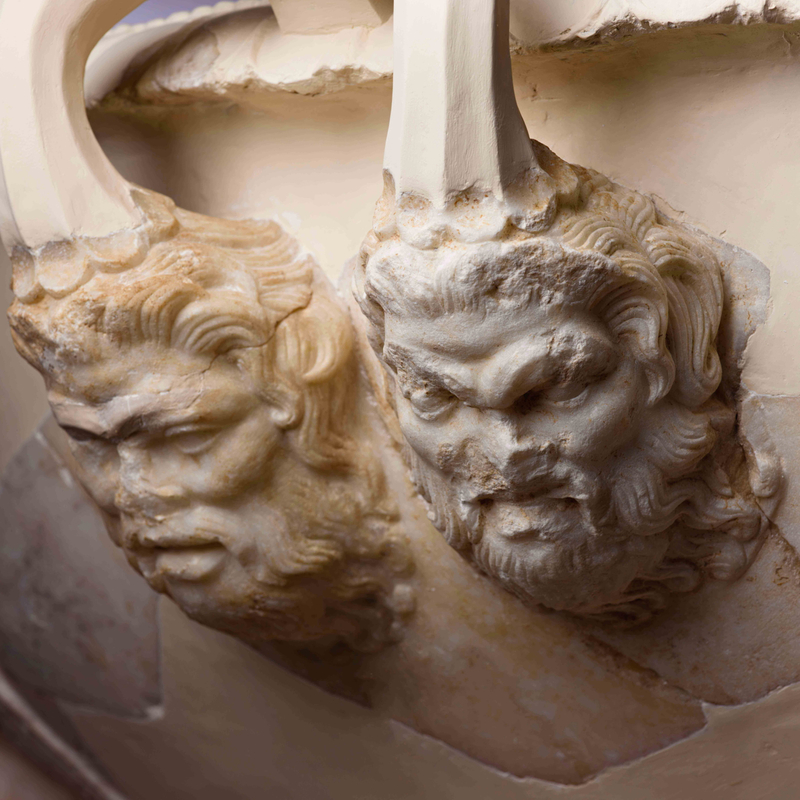 While excavating Lower Herodium, archaeologist Ehud Netzer found marble pieces of a wash basin in the bath-house, including a pair of Silenoi heads – the companion and tutor of the wine god, Dionysos. Conceivably, it was a gift from the Emperor Augustus that his deputy Marcus Agrippa presented to Herod, on his tour of Judea in 15 BCE and installed as a fountain. 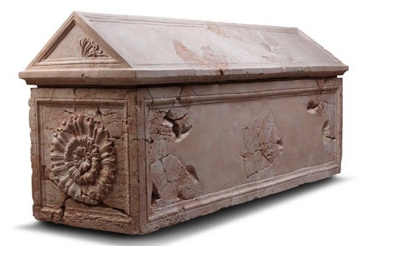 Imagine this fragile and heavy object making its journey from Greece to Rome to Judea and the bath-house at Herodium. 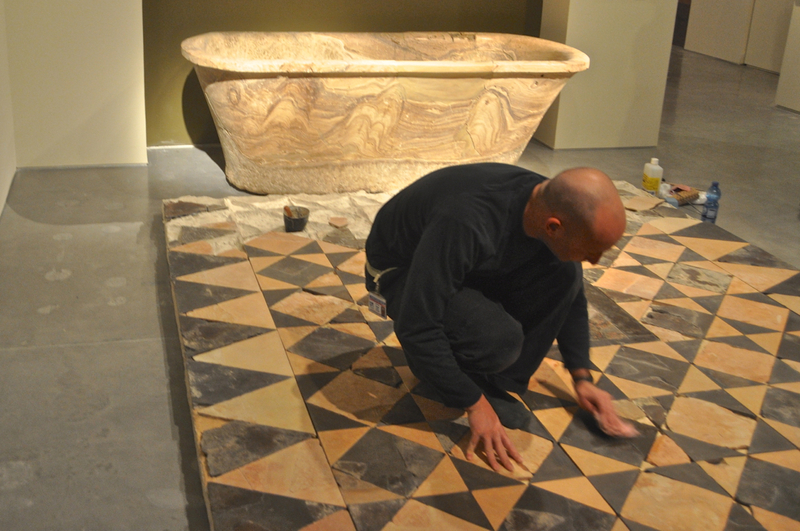 The conservation staff of the museum painstakingly reconstructed the basin with its ornate decoration. Though it is not known to what degree Herod observed traditional Jewish practices, he appears to have respected them. 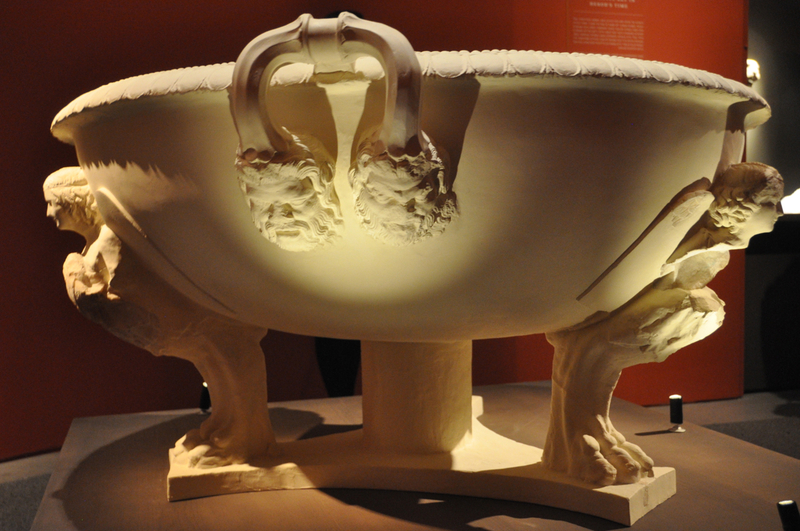 Aside from this basin, no other human images, in sculptural form, have been found in any of Herod’s palaces. When Netzer excavated above the theater at Herodium he found the loggia, the VIP box for Herod and his guests, like Marcus Agrippa. 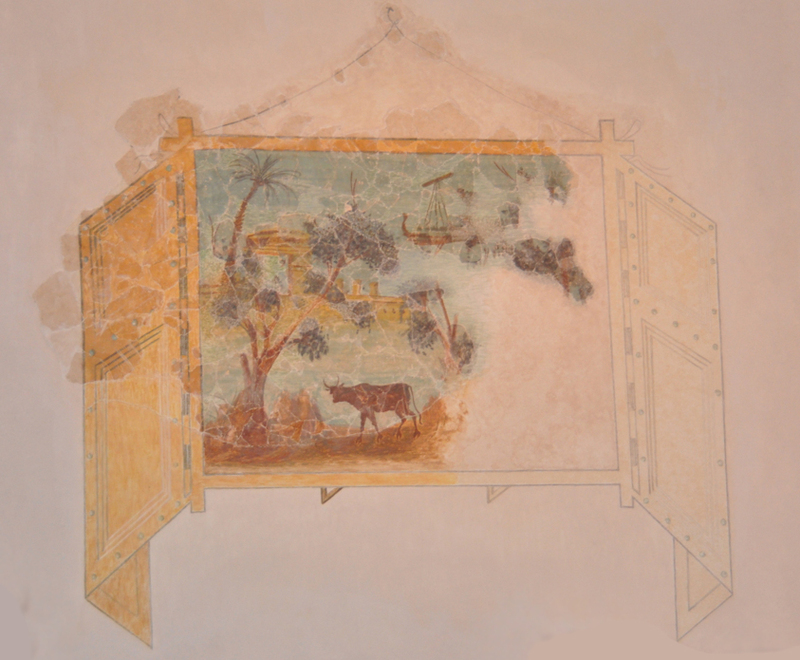 Delicate trompe l’oeil paintings were on the walls, done in secco – painting on dry plaster, a technique unusual for this area. Scenes of nature through a painting of an open-shuttered window, itself a painting hanging on the wall. 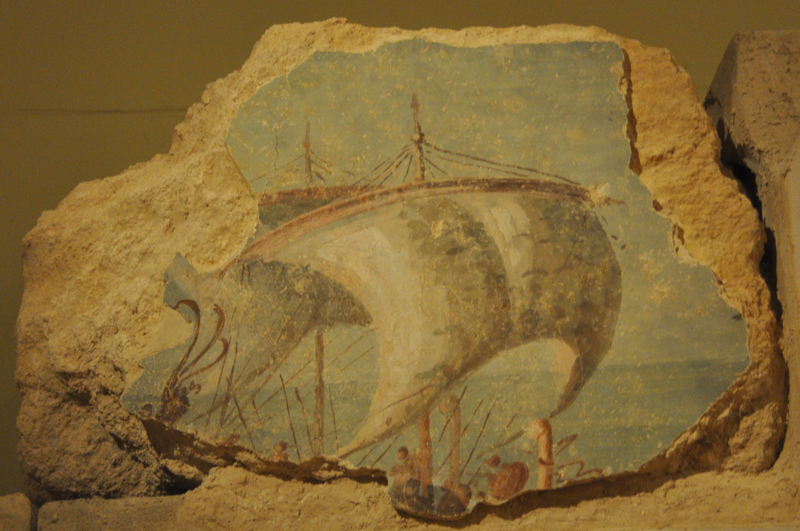 Dudi Mevorah, one of the curators of the exhibit, pointed out a painting of a boat with billowing sail on plaster from the loggia, alluding to Marcus Agrippa’s history-changing victory over Mark Anthony at the naval battle of Actium. Herod dictated the images in the paintings as a lead-in to the discussions that Herod was interested in having with his guest. 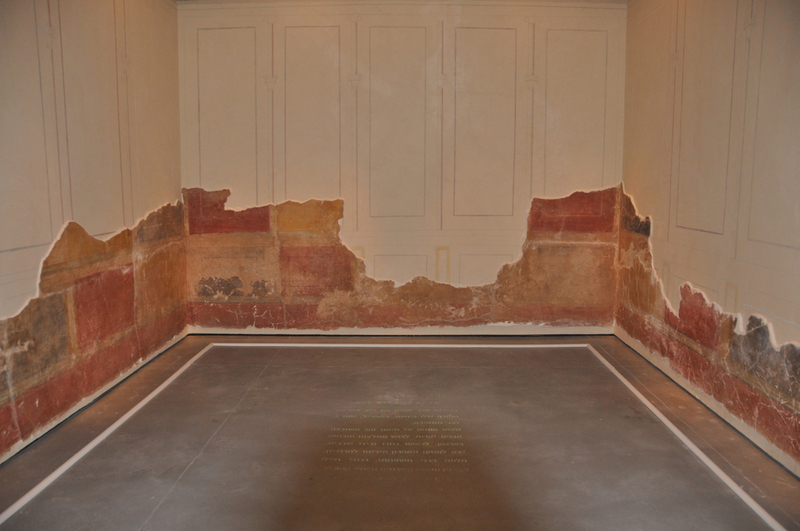 Herod the Great: The King’s Last Journey is a monumental exhibit that should not be missed. It gives us new insights into the very complex figure that is Herod, his determination not be constrained by nature, topography or materials and his consummate grasp of realpolitik. This entry was posted in Archaeology, Architecture, Art and tagged ehud netzer, Herod, Herod the Great, Herodium, israel museum, trompe l'oeil on February 14, 2013 by Shmuel Browns. 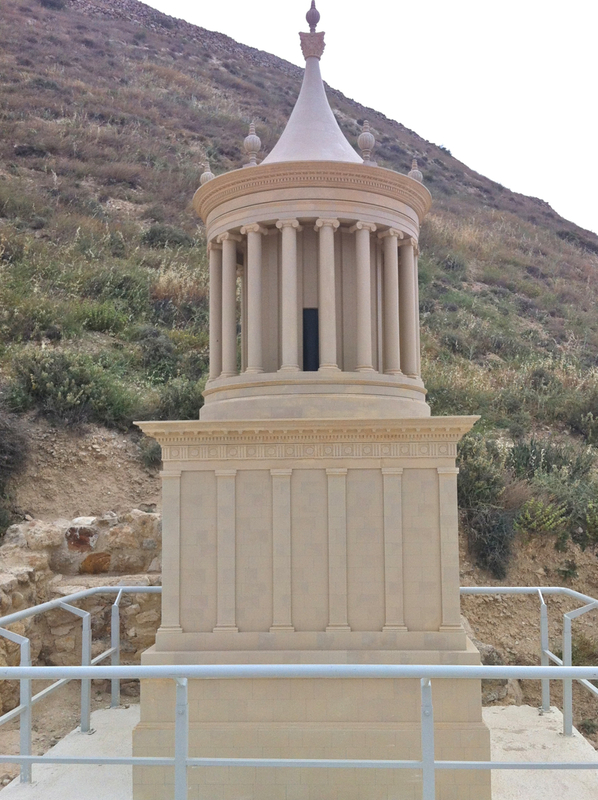 Monumental enough for Herod the Great? So they went eight furlongs [a mile, per day] to Herodium; for there by his own command he was to be buried. And thus did Herod end his life. Josephus, Antiquities, XVII, 8.3. From 37 B.C.E. until his grisly demise in 4 B.C.E., Herod the Great ruled over Judea. World history has anointed few with the epithet “the Great”. He masterminded and engineered the Jerusalem Temple – among the magnificent temples in the ancient world, the fortress-complex at Masada – the most-visited site in Israel, Caesarea – in its day, the largest all-weather harbor built in the open sea, imposing cities, aqueducts, and finally, Herodium – the most spacious palace known to us in the Greco-Roman world before the common era. A giant who moved mountains, Herod was respected, feared, and despised. Reckoning with Herod is indispensable to interpreting the historical and material landscape of Israel. Herod’s passion lives on. 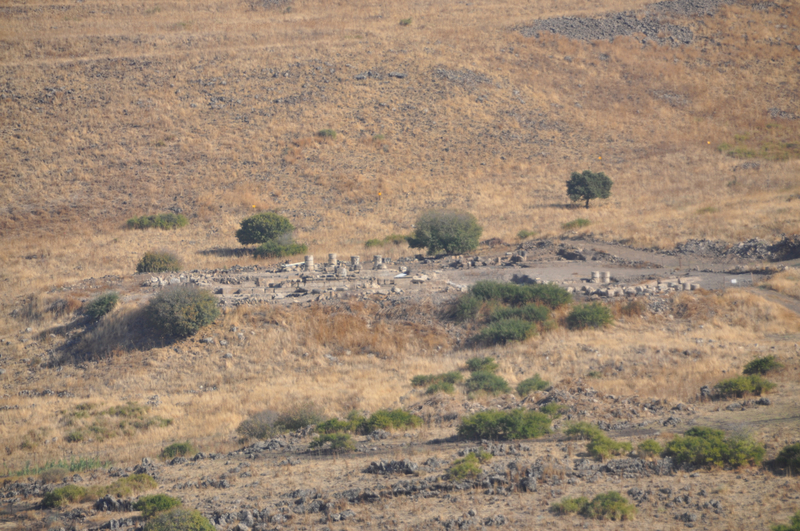 Herod proved to be archaeology professor Ehud Netzer’s nemesis. The Israel Museum staff have been toiling for three years to present Netzer’s discoveries in the first exhibit in the world dedicated to Herod. 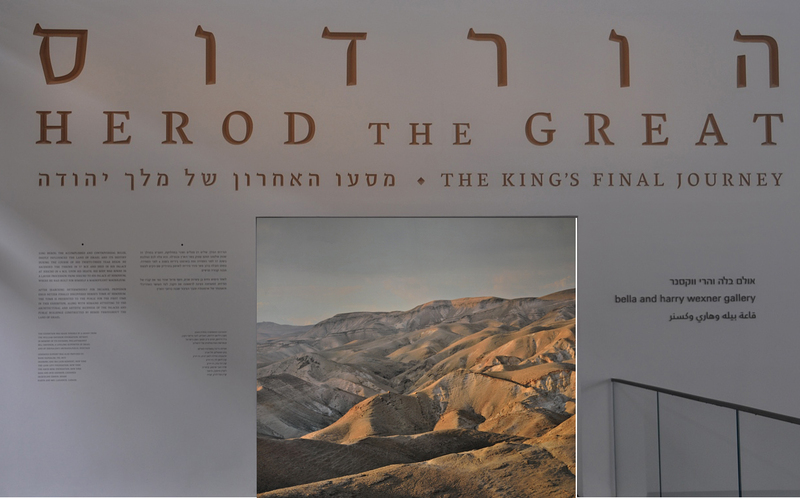 Commensurate with his life and work, “Herod the Great: The King’s Final Journey” is unprecedented in grandeur and expense – displayed in 900 square meters, approximately 250 artifacts related to Herod are exhibited, many for the first time. To show even this tiny sampling of his massive production, Herod fittingly required the museum to reinforce its very foundations. For an in-depth day with Herod – at Herodium and the Israel Museum and/or personalized guided tours of Herod’s other sites and more, please contact Shmuel. This entry was posted in Archaeology, Architecture, Museum, Tomb and tagged ehud netzer, Herod, Herod the Great, Herodium, israel museum, Josephus on February 11, 2013 by Shmuel Browns. If you follow Josephus’ account then there is little doubt that he’s writing about Banias, near the Cave of Pan. There are few remains there so it is hard to ascertain if the structure was a Roman temple. 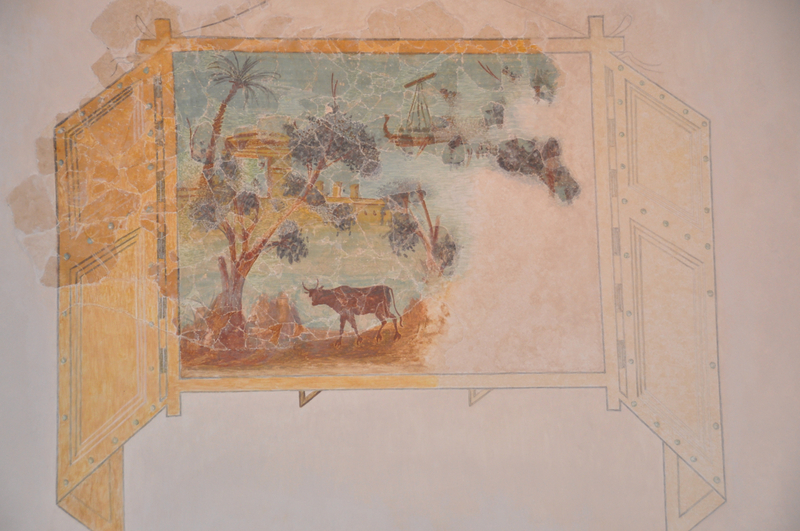 The majority opinion is that the remains of the building in front of the cave is the temple and based on archaeological evidence, an Augustan-period lamp embedded in the concrete interior of one of the building’s side walls, the building was constructed in the later first century BCE. Professor Netzer holds a minority opinion that the temple was to the left (west) of the cave on a prominent terrace because of the remains of a structure with opus reticulatum (a technique sent from Rome to Judea after the visit of Marcus Agrippa in 15BCE) walls, a Herod signature since the only other two examples are at Herod’s winter palace at Jericho and a circular wall uncovered north of Damascus gate that Netzer claims encloses Herod’s family tomb; some pottery remains could also be dated to the time of Herod. 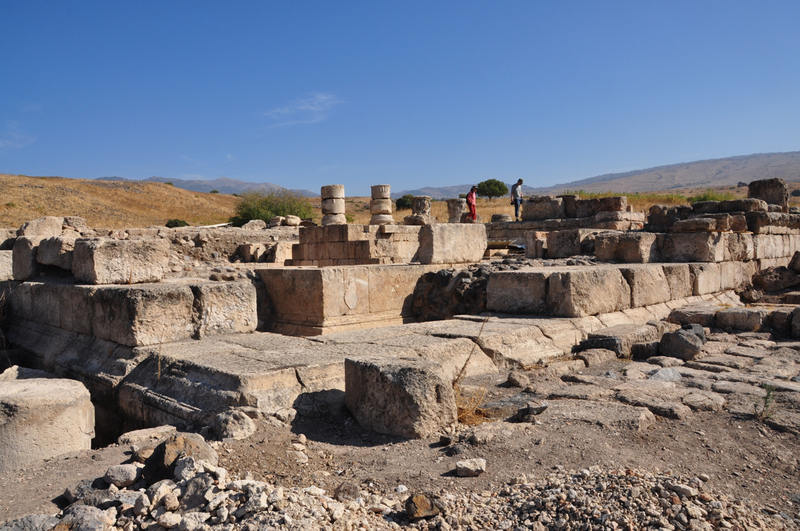 Last week I visited the archaeological site Omrit about 4 kilometers southwest of Banias. The site was first exposed by a brush fire in the summer of 1998 and excavations have been ongoing for ten years. 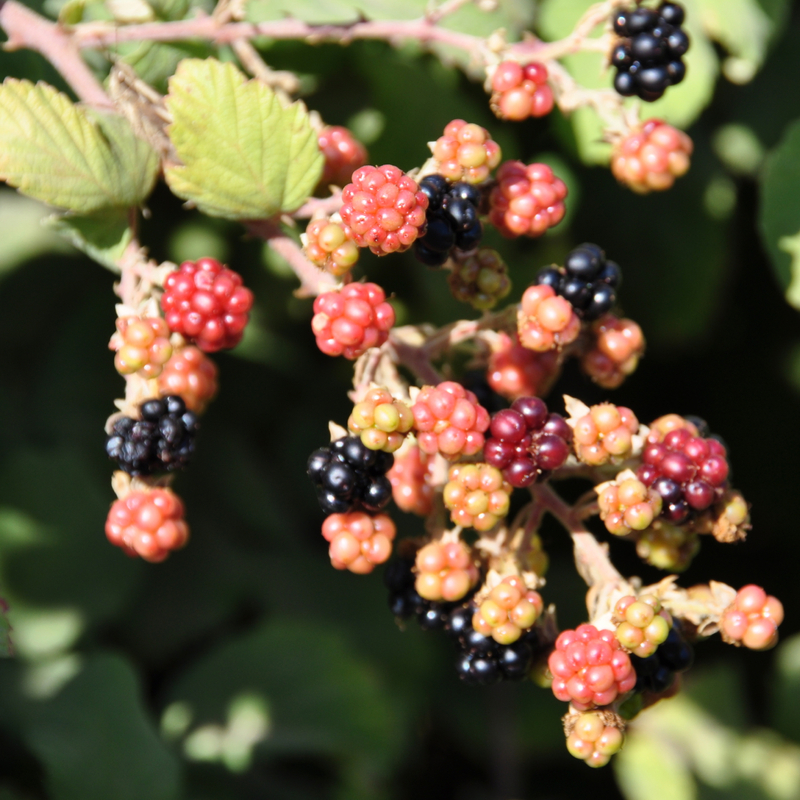 Just as we crossed the stream to enter the fenced area of the site we came across a tangle of blackberries, ripe and delicious. I always try to add tastes when I’m guiding. In Roman times Omrit stood just south of the Scythopolis-Damascus road, a main route. Excavations uncovered a prostyle-tetrastyle temple measuring 25.22 meters by 13.16 meters with stairs leading up to four columns in front of the temple. The height is estimated to be 22 meters. The podium is a perfectly drafted, polished, mortarless structure made of ashlars—a signature of Herod’s grand building style. The temple’s plan reflects the type of Augusteum for celebrating the imperial cult that was common in the period. 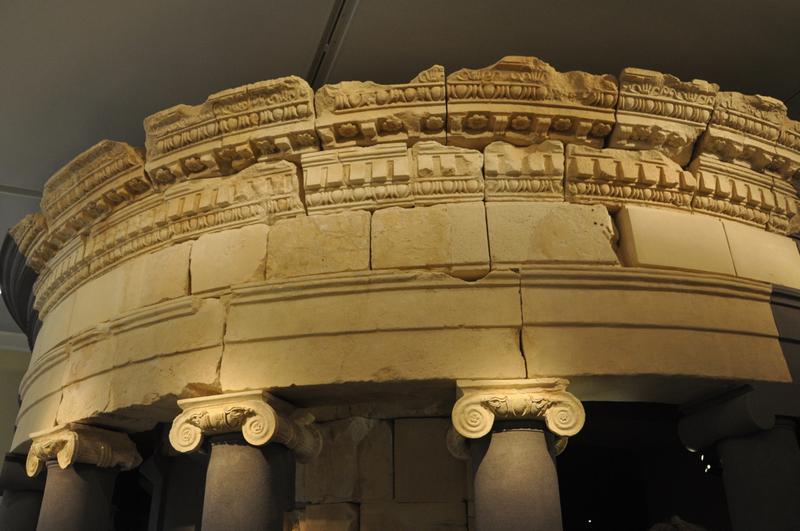 Similar temples were found at Pula, in Croatia, at Nimes, in the south of France and Pompei, in Italy; however, there were also variations in the model. 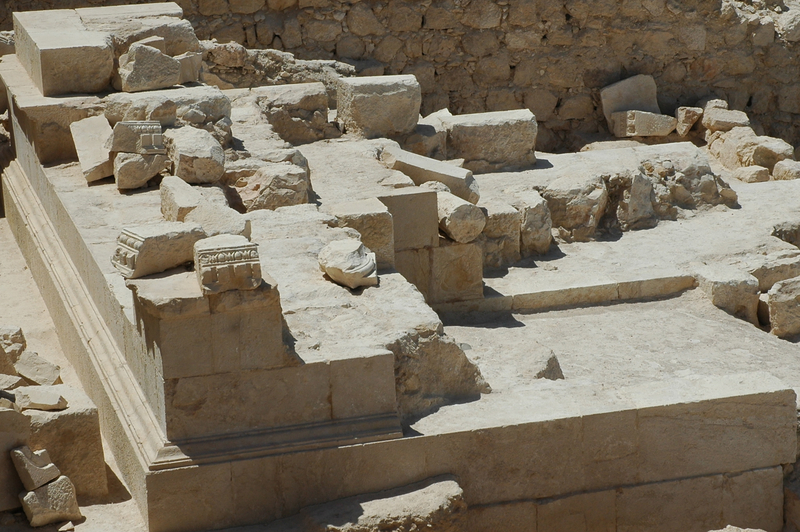 Based on pottery and coins found the temple has been dated to the end of the 1st century BC. In a second phase, it was enlarged to a peripteral plan with 26 columns probably by one of the Agrippas or by Emperor Trajan at the end of the 1st century CE. The temple was destroyed by the earthquake of 363CE and a small chapel was built of stones in secondary usage at the beginning of the Byzantine period. 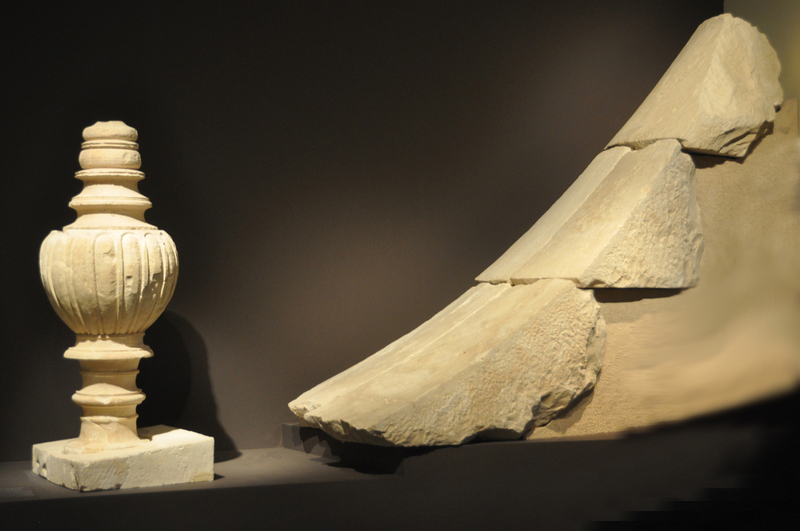 Besides the architectural elements of the temple, bases, column drums, Corinthian capitals , architraves, friezes and cornices which constitue the bulk of the major finds, fragments of statuary and inscriptions were also recovered, one which may make reference to Aphrodite. 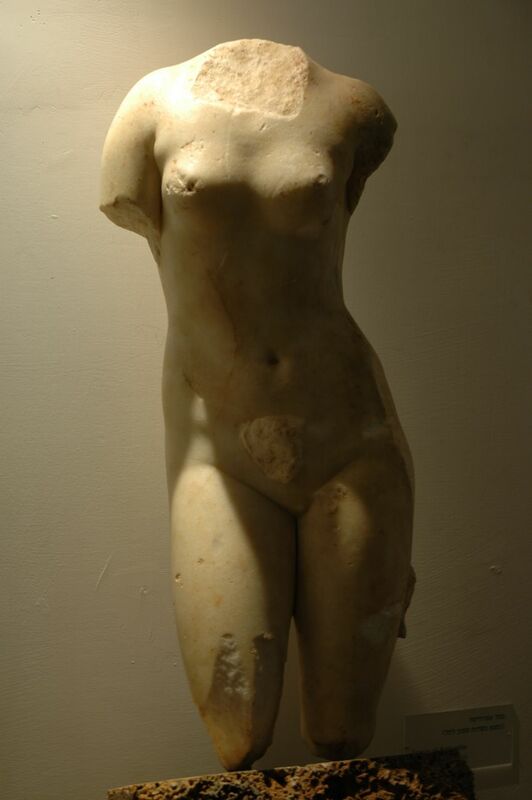 A marble statue was found in the fields at the foot of nearby Tel Dan (on display at the Ussishkin museum) which may have stood in the temple at Omrit. 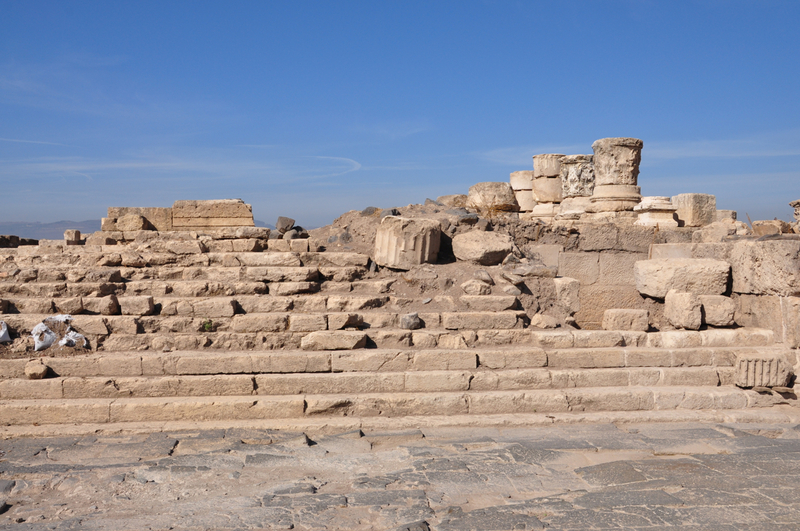 The facade of the temple is similar to what is seen on coins minted by Herod Philip – the question is whether these coins depict Herod’s temple to Augustus or a later impressive temple built by his son to mark the edge of his new city of Caesarea Philippi. This entry was posted in Archaeology, Architecture and tagged Augustus, Herod, Roman temple on November 13, 2012 by Shmuel Browns. I was at Herodium today and took the opportunity to photograph the new smaller than life-size model of Herod’s tomb which has been installed by the path that leads to the palace-fortress. The model was built from drawings by Prof. Ehud Netzer based on the base of the mausoleum uncovered and Netzer’s expertise as both an architect and archaeologist on the Herodian period. Netzer estimates the nefesh as 25 meters high, with a cube-shaped lower level with two rows of decorations below the roof line, a row of egg and dart pattern and below it a row of medallions and vertical bars. 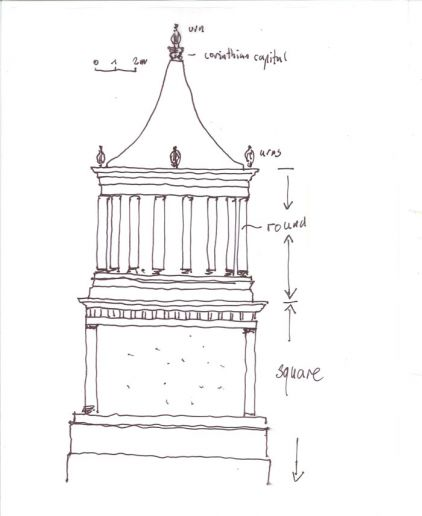 On top of this cube sits a cylindrical second level, a tholos with columns and a conical roof. The model shows Nabatean funerary urns in four places along the roof line and the peak of the cone. We found two pieces of stone carved in the egg and dart pattern a few years ago when I volunteered at the dig. There is also a short video, currently only in Hebrew, that attempts to illustrate the account by Josephus of Herod’s death. Archelaus omitted nothing of magnificence therein, but brought out all the royal ornaments to augment the pomp of the deceased. There was a bier all of gold, embroidered with precious stones, and a purple bed of various contexture, with the dead body upon it, covered with purple; and a diadem was put upon his head, and a crown of gold above it, and a secptre in his right hand; and near to the bier were Herod’s sons, and a multitude of his kindred; next to which came his guards, and the regiment of Thracians, the Germans. also and Gauls, all accounted as if they were going to war; but the rest of the army went foremost, armed, and following their captains and officers in a regular manner; after whom five hundred of his domestic servants and freed-men followed, with sweet spices in their hands: and the body was carried two hundred furlongs, to Herodium, where he had given order to be buried. There were a half dozen people working at the tomb site. I noticed the remains of some additional structures that have been uncovered. Unfortunately, access to the tomb area is still closed. 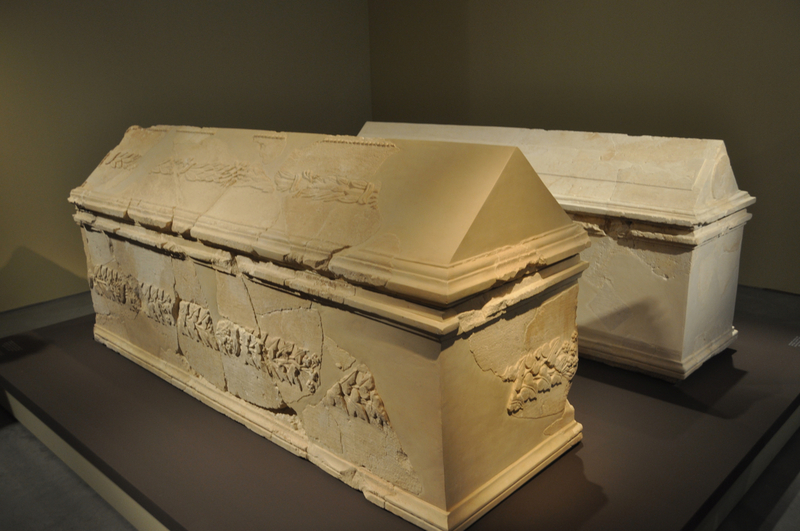 This entry was posted in Archaeology, Architecture, Tomb and tagged ehud netzer, Herod, mausoleum, model, Tomb on May 2, 2012 by Shmuel Browns.